Included in the 1873 booklet entitled Constitution, By-Laws and Code of Medical Ethics of the Maine Medical Association is a list of the members, by their counties of residence, as those counties exist today. 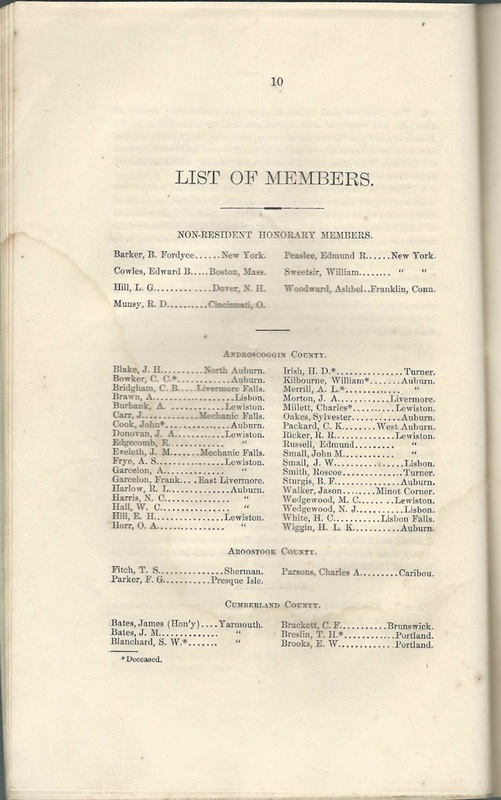 This post identifies the three members who were practicing in Aroostook County in 1873. T. S. Fitch at Sherman, Maine. He was presumably Dr. Thomas Simon Paddock Fitch, born May 12, 1846, at Saint John, New Brunswick, son of Simon and Margaret (Paddock) Fitch. 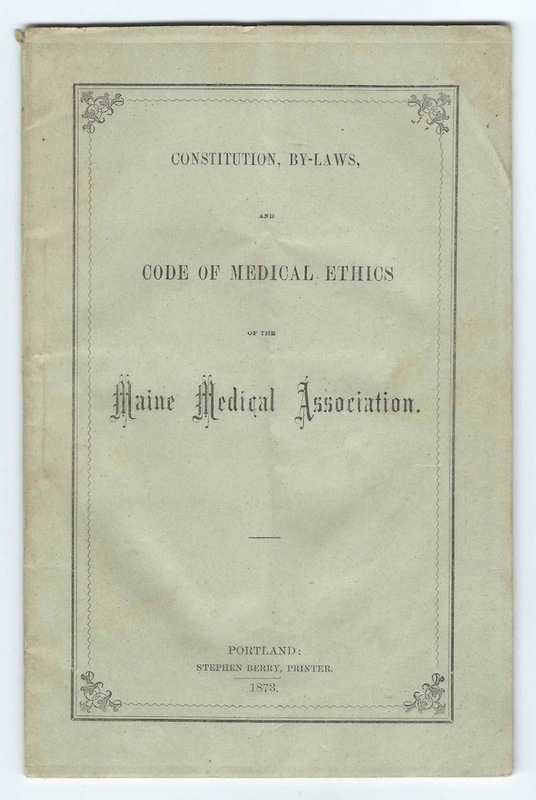 Dr. Fitch was an 1865 graduate of the Medical School of Maine at Bowdoin College in 1865. 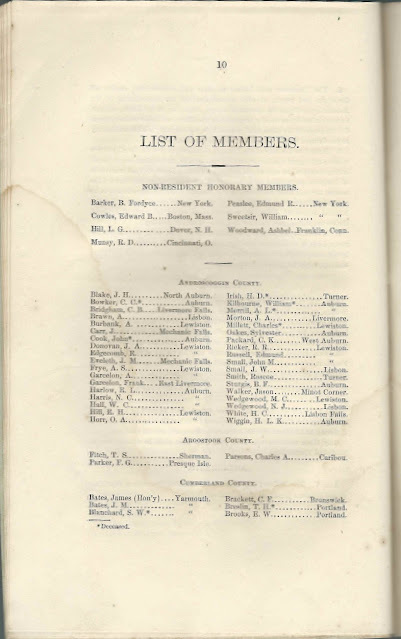 He then attended at Bellevue Hospital Medical College in the late 1860s and was practicing medicine at Lewiston, Maine by 1871, when his name appears in that year's city directory. He married Clara Folsom Palmer at Boston, Massachusetts, on December 10, 1879. Clara was a Portland, Maine, native, the daughter of then Boston merchant Stevens Gould Palmer and Louisa Folsom (Baker) Palmer. Dr. Fitch later practiced at Orange, New Jersey. He died of bladder cancer at Portland, Maine, on August 23, 1909. F. G. Parker at Presque Isle, Maine. Frederick Grafton Parker, "Fred", was born September 24, 1840 at Corinth, Maine, son of Elisha Parker and Christiana (Thomas) Parker. Fred graduated from the Medical School of Maine at Bowdoin College in 1863 and served as a surgeon in the Civil War. On February 22, 1865 at Corinth, Maine, he married schoolteacher Theresa A. Nichols, daughter of Humphrey and Marcia Nichols. Dr. Parker died August 18, 1883. He and Theresa, who died in 1910, are buried in the Fairmount Cemetery at Presque Isle, Maine. Charles A. Parsons at Caribou, Maine. Charles Aaron Parsons was born January 18, 1824 at Buckfield, Maine, son of Aaron Parsons and Eunice (Warren) Parsons. According to a brief biography in A history of Buckfield, Oxford County, Maine, from the earliest explorations to the close of the year 1900 by Alfred Cole, Dr. Parsons received his medical training in Vermont. In 1852, Charles married Mary Frances White, possibly at Skowhegan, Maine, or St. Albans, Maine. By 1880, Charles had his medical practice at Friendship, Maine, where he died in 1886. He had also practiced medicine in Wisconsin and in the Maine towns of Hartland and Buckfield. He died in 1886. If you have information on any of the physicians mentioned above, please leave a comment or contact me directly.